Moist homemade chocolate cupcakes, topped off with silky chocolate cream cheese frosting! 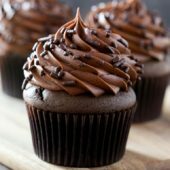 Rich and dreamy cupcakes, perfect for any chocolate fan! Preheat oven to 350°F degrees. Line a standard cupcake pan with 9 paper liners. In a large bowl or stand mixer, beat together butter and sugars until light and fluffy. Mix in egg and vanilla. Scrape the bowl as needed. Mix in salt, baking soda and cocoa powder, followed by sour cream. Add flour, followed by milk. Mix until just combined and no streaks remain. Divide batter between prepared liners using a large cookie scoop. Bake for 18-20 minutes or until a toothpick inserted comes out clean. Cool in pan for several minutes, then transfer to a wire rack to cool completely. When cupcakes have cooled complately, prepare frosting. In a large bowl or stand mixer, beat together cream cheese and butter until smooth. Add vanilla, followed by sifted cocoa powder. Scrape bowl as needed. Mix until fully combined. Add powdered sugar 1 cup at a time until fully combined. Lastly, slowly drizzle in heavy cream. Mix until fully combined and no streaks remain. Transfer frosting to a large piping bag fit with desired tip. Frost cupcakes and immediately top off with chocolate sprinkles. Store cupcakes in an airtight container at room temperature for up to several days. Cupcakes may also be stored in the refrigerator. If chilling, bring to room temperature prior to serving. *A jumbo closed star tip was used for this recipe.